Autograph Letter Signed, recommending a friend’s book called Patrollers of Palestine. 1 page 8 x 5 inches, thin tape along two edges. Daily Telegraph, London, 24 October 1906. Bennet Burleigh (1840-1914), war correspondent and soldier, author of several books on Victorian campaigns, including Sirdar and Khalifa and Khartoum Campaign. In 1904 he reported the Russo-Japanese War, resenting the Japanese restrictions and censorship, and praising their military qualities. He demanded military training, as in Japan, in British state-aided schools. 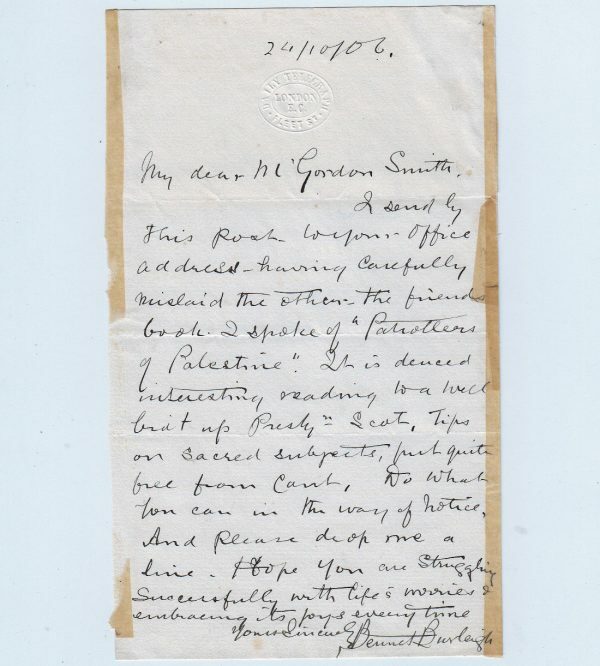 From this war correspondence he compiled Empire of the East (1905).